The New Orleans Jesuit Provincial, the Rev. Mark Lewis, S.J., announces the appointment of the Rev. Peter Rogers, S.J., as the new rector of the Loyola Jesuit community. Rogers replaces the Rev. Jim Bradley, S.J., who has been appointed director and superior of Ignatius Residence, the infirmary and nursing home of the New Orleans Province of the Society of Jesus in Algiers, La. Bradley will take office Nov. 1. In addition to serving as rector, Rogers also replaces Bradley as vice president for the Loyola University New Orleans Board of Trustees. Rogers is an associate professor of French. 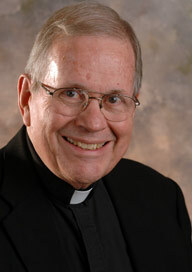 He is a native of Jeanerette, La., and has been a member of the Loyola Jesuit community and Loyola faculty since 1982. He earned a Bachelor of Arts degree in French from Spring Hill College in Mobile, Ala., and a master’s degree from Middlebury College in Vermont. He also holds a master’s degree in theology from Centre Sèrves in Paris. He earned doctorates in French literature from the Université de Paris IV–Sorbonne and Columbia University. Bradley taught for three years at Jesuit high schools in New Orleans and in Shreveport before beginning his theological studies. He earned an S.T.L. degree from Saint Louis University in 1968, a bachelor’s degree in physics from Spring Hill College in Mobile, Ala., and a master’s degree in secondary education from the University of New Mexico after having done graduate work at Fordham University in New York City, Texas A&M University and Louisiana State University. He received his doctorate in educational administration in Fordham University’s Church Leadership Program. Bradley served as the provincial superior of the New Orleans Province of the Society of Jesus from September 1996 to July 2002. Bradley was also the associate director and a senior research fellow in Loyola’s Jesuit Center.